While we see each high-rise project as a market unto itself, for brevity, we occasionally refer to the “market” for high-rises. The high-rise market is registering fairly flat sales rates, however pricing continues to ratchet higher in a majority of buildings. There are some notable performers. 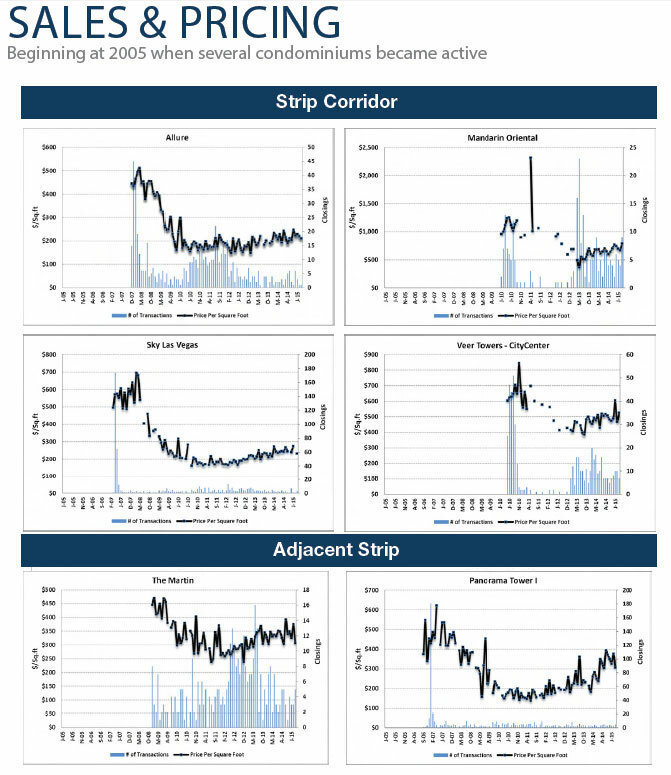 In the past couple of years, Downtown has had rather tight supply, with limited resale activity in Newport Lofts and Soho Lofts, both of which have exhibited solid price convexity off of their 2011 lows. Supply issues have been alleviated somewhat by a marketing push by new ownership at The Ogden. 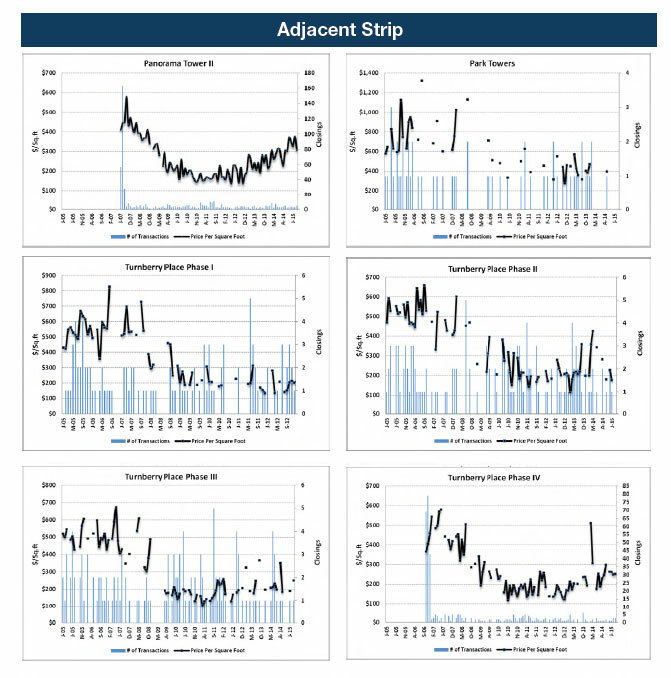 This has propelled area sales activity further with ten closings in the first quarter. Rental activity also remains strong in the area as it appears that many individuals are gravitating towards a more urban lifestyle. 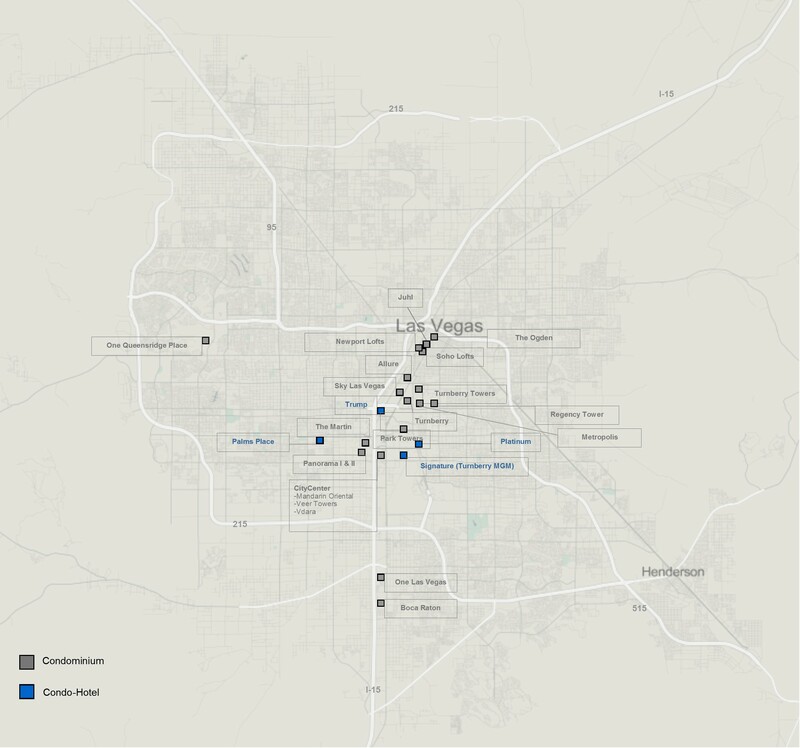 Recent downtown developments are providing an expanded employment base, albeit on the largely on the low to middle spectrum of incomes. These developments are also enriching the lifestyles of Downtown residents with something new happening seemingly every month. For Strip and adjacent Strip projects, The Martin is largely sold out following a bulk purchase by the REIT iStar Financial to Paul Kim in the late summer of 2014. Pordes Residential continues to market residences at Veer Towers, which holds a lot of the actively marketed inventory on the Strip, despite selling through a significant amount of homes following the bulk sale of 427 units by CityCenter Residential to Ladder Capital. Veer Towers has had a pretty solid quarter, closing 27 units. The Residences at Mandarin Oriental, a super-prime project within CityCenter, is also largely sold out, with just a handful of units still remaining. This was one of the few condominium projects still attached to the original sponsor. Closing velocities have been solid, continuing to prove that a high-end market is firmly established in Las Vegas. 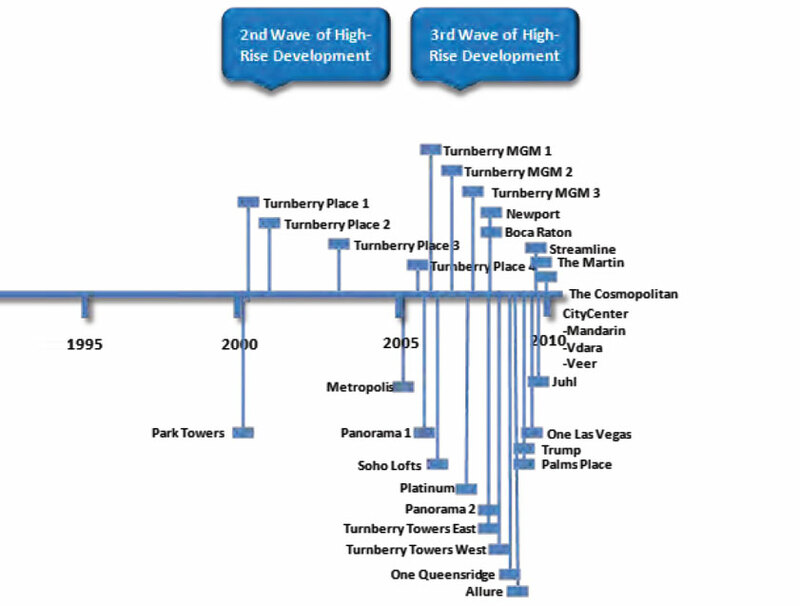 Similarly, One Queensridge Place, which consists of two luxury towers in Summerlin, the large masterplan in the west Las Vegas Valley, is mostly sold out as well. The project also registered one of the 2015’s largest sales to date, with a massive penthouse trading for $7.7 million. Top floor penthouses measure nearly 15,700 sq.ft, a rare example of vast horizontal space in a vertical project. 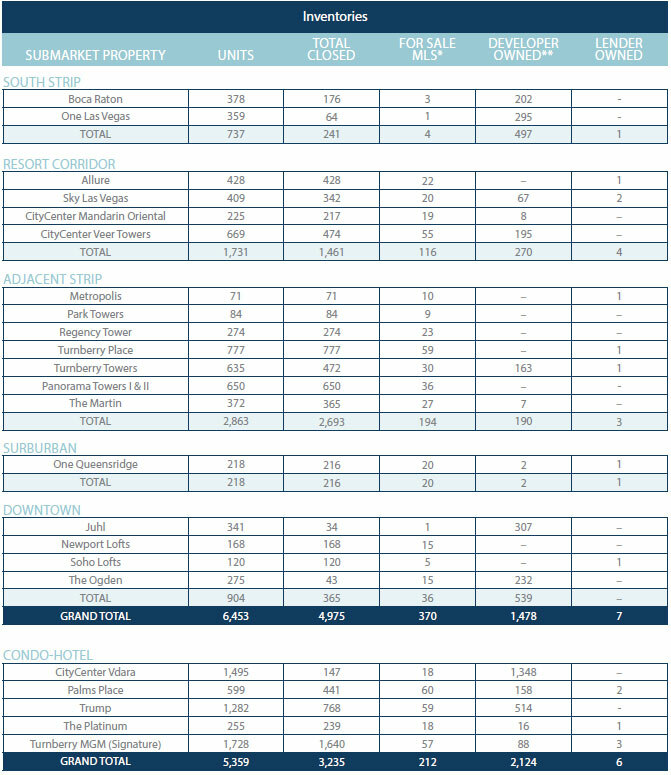 Sky Las Vegas, which has generally been a quite player on the strip, has 67, mostly rented units for sale at an undisclosed price. 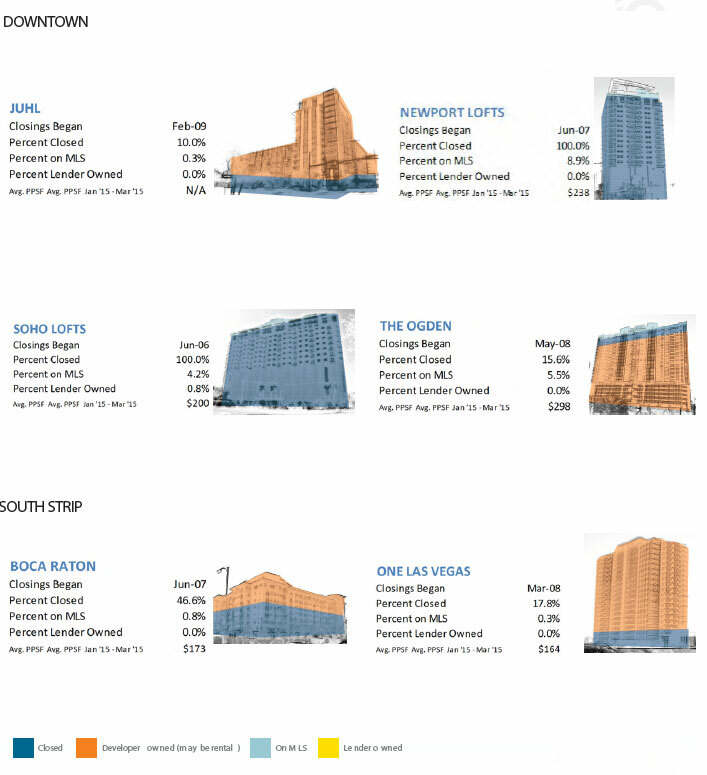 These units represent some of the last developer held units on the Las Vegas Strip. 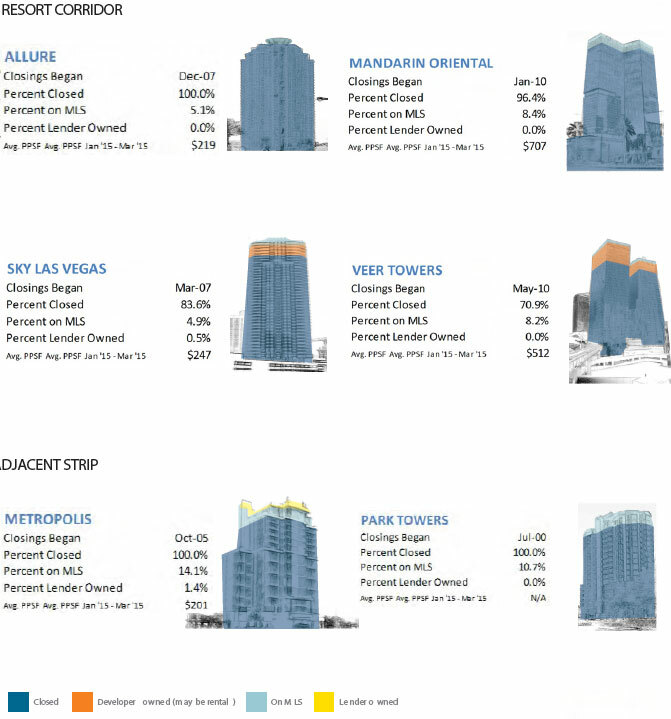 In addition to the bulk offering at Sky Las Vegas, the actively marketed projects by the developer or secondary buyer are Turnberry Towers, The Residences at Mandarin Oriental (although nearly complete), Veer Towers, The Ogden and One Queesridge Place (also nearly complete). 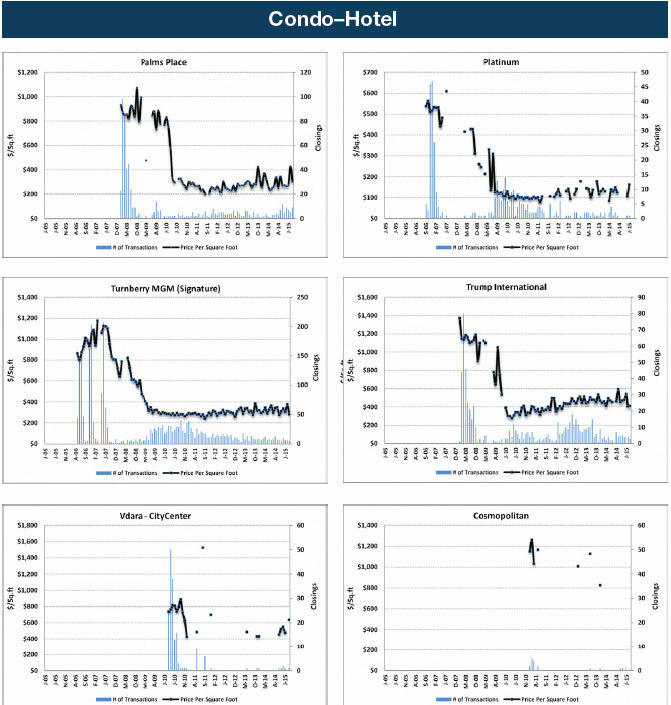 In condo-hotels, Palms Place and Trump are actively engaging the marketplace. Turnberry Towers recently re-invigorated its sales with The Mark Company taking over marketing in January on behalf of its owner, CIM Group. Studio units were presented in the low-$300,000’s, one bedrooms were in the $400,000’s and three bedrooms were priced from about $1.3 million. Closings have been occurring in the low $300 per-square foot range up to nearly $400 per-square foot. 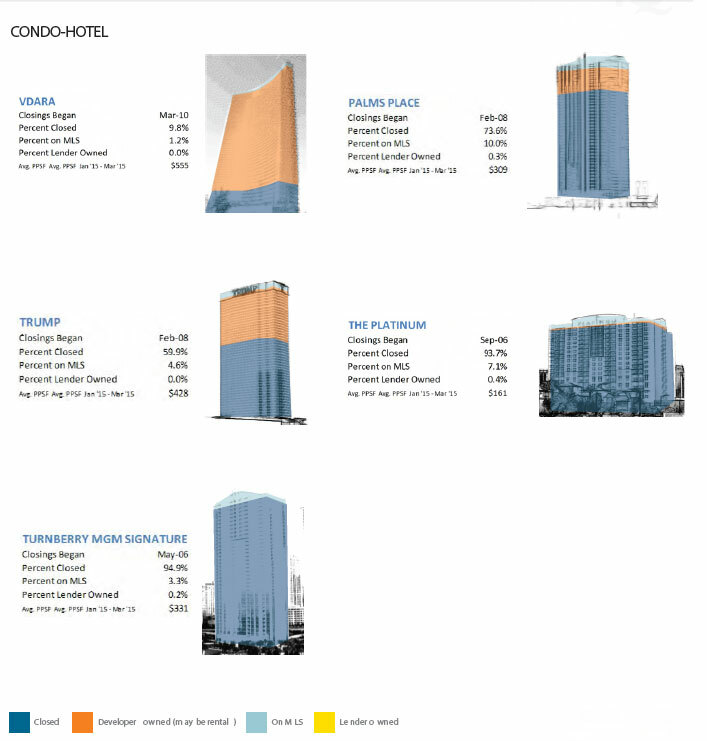 In the condo-hotel sector, Trump continues to experience a handful of sales each month and is marketing studio units from $261,000 and one bedrooms from $515,000. The developers inventory still has a mix of north strip or south strip views. Palms Place is also an active player, closing over 20 units this year. The high-rise category gets a lot of attention for the price per-square foot numbers associated with deals. Naturally since vertical product is prevalent in the coastal regions and throughout Europe and Asia, its fun to make comparisons. 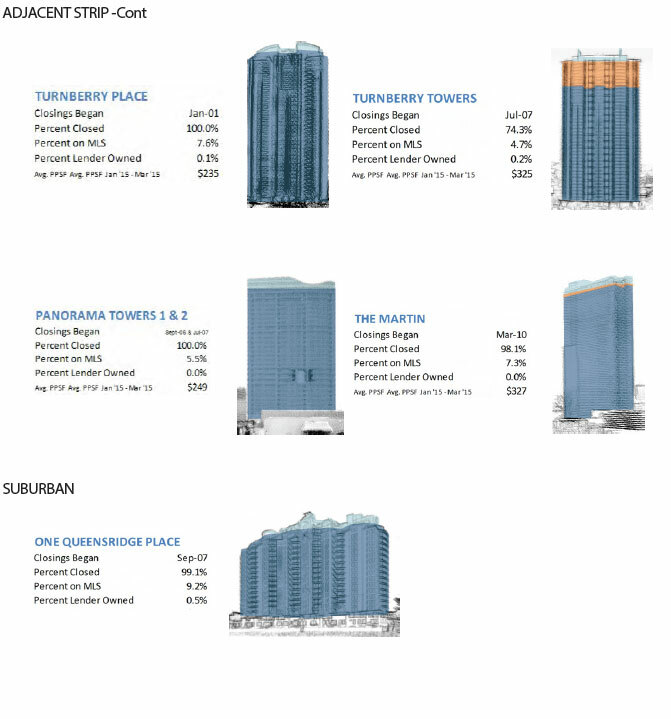 The long-time price leader in the condominium sector has been The Residences at Mandarin Oriental “Mandarin”, followed by Veer Towers and One Queesridge Place. Mandarin has been tricky to characterize since a lot of gray shell units have traded there, providing buyers an opportunity to express their own vision for interior design. Similarly, One Queesridge Place is so unique in that it is essentially an urban product in a suburban space, with a certain old world aesthetic, making price comparisons to other domestic projects confusing. Nevertheless, when we examine what $1 million can buy you in many other global cities, it makes those cities look tragically expensive. For example, at Mandarin you could get almost 147 meters2 of space for around $1 million. Borrowing from Knight Frank’s index, $1 million would get you about 57 meters2 of space in Los Angeles, 21 meters2 of space in London,48 meters2 of space in Shanghai and 79 meters2 of space in Moscow.1 Further, a lot of projects in those comparisons may not have equivalent luxury or owner benefits. 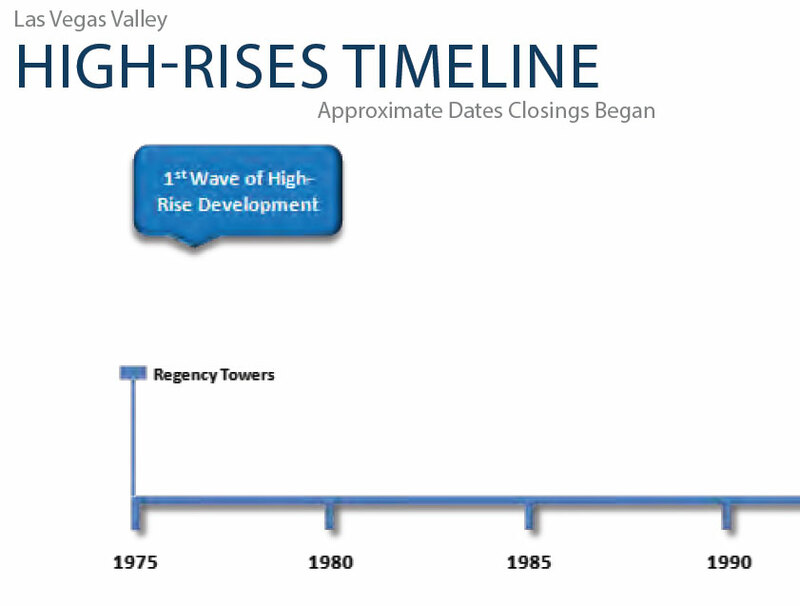 The high-rise market in Las Vegas is experiencing sales at a moderate but likely sustainable pace, relative to the historical set. Buyers continue to be engaged by the value proposition offered within many of the projects and lifestyle, rather than pure investment, continues to be the broad theme. An improving local economy and strong visitor volume to Las Vegas points towards a gradually firming price environment in the future, although this will not be uniform between projects. For Las Vegas Strip properties, both condominiums and condo-hotels are likely to benefit from amplified activity on both the Northern and Southern portions of the Strip. Genting Group recently broke ground on the Resorts World Las Vegas project on the North strip and MGM Resorts International (“MGM”) and AEG are in the vertical stage of development on the 20,000 seat Las Vegas Arena. Additionally MGM is building a large outdoor park project which will be both a destination and a draw from the Strip. Mandalay Bay is currently underway on the large expansion of its Convention Center. The Las Vegas Convention and Visitors Authority is also expanding towards the Strip following the purchase and subsequent shutdown of The Riviera. The Convention Center and Global Business District will greatly expand the already massive footprint of the convention business in Las Vegas. In general, this sector deserves a lot of attention by potential owners. 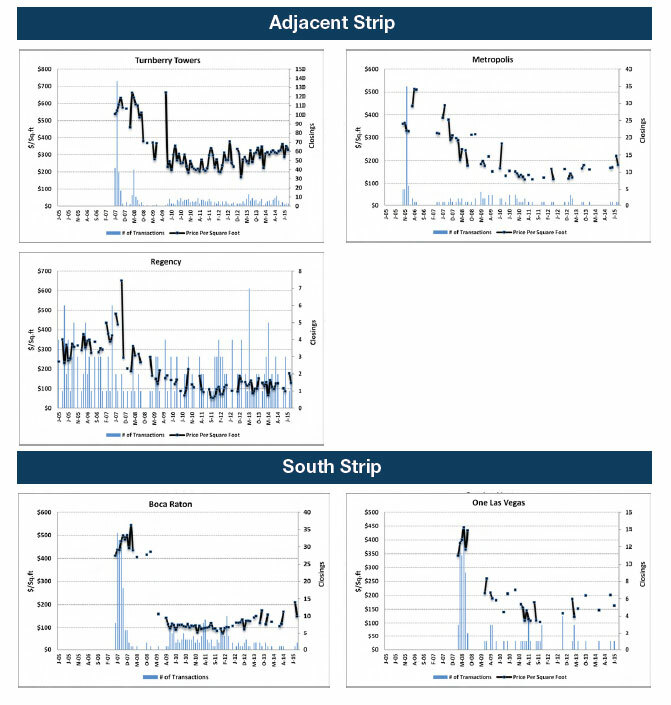 The sector is maturing gradually towards a more sustainable price track based on stronger equity positions. There are currently few bank owned homes within these projects. 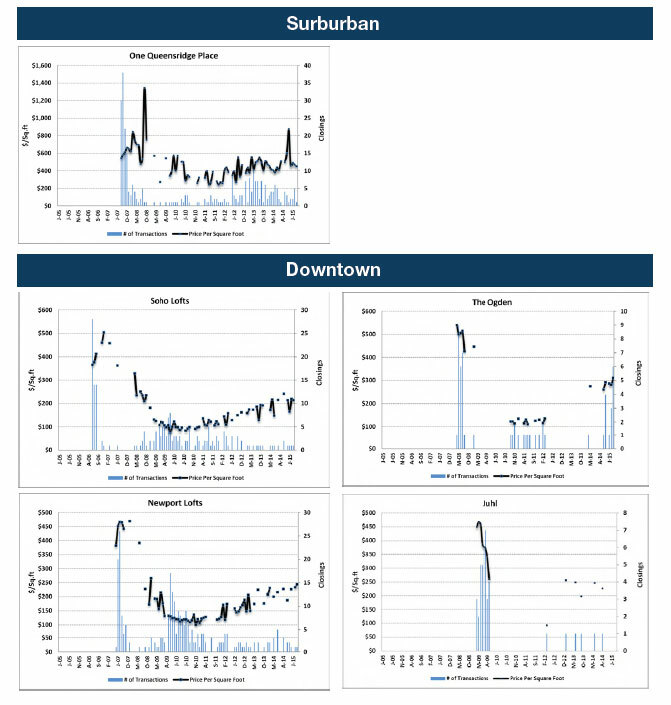 Substantial negative equity does remain within some buildings but we are not observing significant pressure to sell. Many owners are just choosing to wait or enjoy the use of their units enough to maintain timely mortgage payments. Source: Clark County, Col dwell Bank er Premier Realty.